Every homeschooling family has a story. The reason why they homeschool. Or perhaps it is not one single reason, but many small things that make a big decision easier. I suppose we fall into the latter. 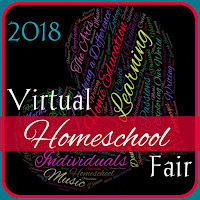 This week during the Virtual Homeschool Fair, hosted by Susan @ Homeschooling Hearts and Minds, families are sharing The Reasons We Homeschool. Here are my top 5 reasons, in no particular order. Although the seed for homeschooling was planted when I was expecting our first child, because I knew I would never be ready to hand my children over to a system, I think the journey really started as it came time to enroll our oldest in Pre-K. I was working full time, and the boys went to a private babysitter. Neither my job, nor the babysitter's home, were in our local school district. It wasn't long before we realized it wasn't going to work. Husband had ruled out the school bus long before we ever had kids, and we live rural, so we would have been driving all over creation; plus the school hours and our work hours were in conflict. If I was going to go part time or quit work to just shuttle the kids back and forth, why not homeschool? It wasn't long before we realized that seed was now a firmly rooted desire to nurture and educate the children from home, and shortly after I resigned from my job to start this crazy, rewarding journey! Homeschooling means we have the freedom to rearrange our schedule - for anything! We can travel "out of season" when weather is milder, rates are cheaper and crowds are smaller, because it fits our family's preferences. We did not have to change the way we did things when the kids hit school age, just to fit a public school calendar. We can also change our schedule to accommodate my husband's job. He sometimes works evenings or weekends when needed, and he occasionally travels for work. I don't have to worry about the kids missing time with him, because our schedule and our routines are flexible. If we want to spend half a day playing board games, or reading about former presidents, or watching educational science videos on YouTube, it is of no real consequence to our schedule. I can shift things around, and likely still complete a full week's worth of work on schedule. A flexible, but fluid, schedule is not just a benefit, it's really a necessity. No crowds, and less heat! One of the most challenging aspects of homeschooling is knowing if we are making the right choices along the way. What history cycle should we follow? Should we change math programs? What homeschool method is best? Honestly, even these answers change from time to time. Flexibility is a necessity, after all. I have found that in order to give my children the best education, I have to make it their education. That means there is no "right" answer, because it is about what is best for them at that moment. I do believe I have chosen an educational philosophy that is easy to follow and also easy to adapt (Charlotte Mason - more on that next week), because with her methods, I can help each child recognize their talents and strengths, and work on any weaknesses. When it comes to more standard subjects like math and writing, I can still tailor their lessons to their needs. They don't have to go as fast or slow as a class; they go at their own pace, in their own time. As an extension of trying to create an individual education for each child, it means I know what they are learning. My husband and I are the primary influence in our children's lives and education. Despite the great teachers that do exist, they often admit their hands are tied. As their parent and "teacher" I can guide them in a Biblical education. I know the materials we use are clean and wholesome, and I can address religion, politics, stereotypes and world views accurately, fairly and from a Biblical standpoint. I also know they won't be studying content that is beneath their comprehension or too mature for them, because I have researched to make sure their books are appropriate. I get to see when that triumphant AHA moment happens! I get to share in the stories of the books we read together, and we can discuss literary characters or people from history over lunch. I am learning alongside them often, and they are intrigued because I am intrigued. They enjoy learning with me, which makes the process that much more fun for me! With each new generation that homeschools, we are eroding that weird, unsocialized homeschool stereotype. I try to attend special homeschool classes and events offered by businesses, or to use their educational discounts when offered. I contact other businesses to discuss their homeschool policies. I want them to know there is a homeschool presence, and there is a need for more businesses to have homeschool-friendly policies. I contact the school board (when necessary) to let them know I am aware of my legal rights, so they know homeschoolers are informed. I let my kids play outside during "school" hours (PE and nature study!) and we run errands during school hours, because homeschoolers before us fought for the legal protection to homeschool, and not hide in fear. I firmly believe that we should make society aware that homeschooling isn't just legal, but it's growing, and it is a quality form of education. Parents have the right to choose the educational path that is best for their children, and I am proud to be a part of that. I love showing others that homeschooling isn't about the final destination; it's about a unique journey. Now, let's see what my fellow homeschool bloggers have to say about The Reasons We Homeschool. 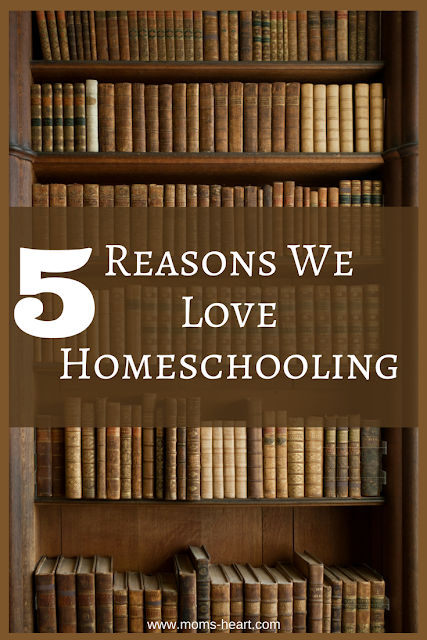 Each week for the rest of the month, we'll be sharing a peek into our homeschool. We love the flexible schedule that homeschooling gives us! Logistically easier!! YES!!!! My friends with kids in school say they don't know how I do it, I don't know how THEY do it!!! LOL it sounds like such a pain to have to have everyone up and ready and off to school every day, pick them up, do homework etc etc. I love that I get to be my girls! Great post.